Food in 2 Worlds: Are Healthy Eating Messages Reaching NYC’s Immigrants? In this Food in 2 Worlds podcast, Fi2W reporter Juhie Bhatia and nutritionist Christina McGeough discuss efforts in New York that encourage immigrant communities to eat healthier. 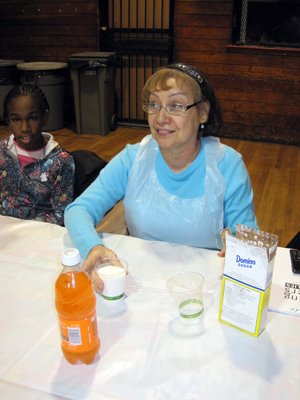 At a ‘Cooking Matters for Families’ class at the Bronx Spanish Evangelical Church in December, around 30 participants sat under fluorescent lights at tables with Christmas-themed plastic coverings. Fruits and vegetables lay in front of them on flimsy cutting boards. The day’s menu: veggie pizza on whole wheat English muffins and a fruit and yogurt parfait. The instructions were translated into Spanish, as two-thirds of the class was Hispanic. Then everyone started chopping. The children–who made up half the class–used colored plastic knives. While obesity and related health conditions disproportionately impact Latinos and other minority groups in New York City, there is no coordinated effort to reach immigrant groups with healthy eating messages. To fill the gap, various organizations and individuals are developing their own ways to encourage these groups to eat healthier. Gladys Bonilla learned about the cooking class on a visit to the church’s food pantry and soup kitchen. Bonilla moved to the area from Honduras in 1985. At first, one of her two granddaughters didn’t want to go. Now the girls push her to attend the class weekly. “I feel happy in this place,” Bonilla said in Spanish through a translator. “I feel like part of the family here.” Many of the recipes she’s been taught in class aren’t typical of the Honduran food she makes at home for her family. But Bonilla, who has diabetes, said she’s learned a lot about healthy eating. She has cut the amount of salt and oil she uses, and eats fewer fried foods. City Harvest, a non-profit organization that sponsors the six-week course, doesn’t mold its cooking classes around traditional ethnic diets—it simply focuses on teaching healthy cooking techniques, recipes and nutrition basics. But some experts say that to make a major impact on a person’s diet—particularly if they are an immigrant—an understanding of their food culture is key. “Often people create one-size-fits-all materials and it’s not useful,” said Christina McGeough, a certified diabetes educator who’s worked as a bilingual nutritionist for almost 10 years. “You need to know who the person or population is. Once you know that, you can design a message that speaks to them,” she said. “When you’re thinking about improving health and cooking, think of heritage as a motivator,” said Sara Baer-Sinnott, president of Oldways, a nonprofit that released the Mediterranean diet pyramid in 1993 and has since created pyramids and “healthy plates” for four other ethnic diets. “There’s so much science that continues to come out that traditional diets are so much healthier for not only weight control, but health conditions like cardiovascular disease,” she added. 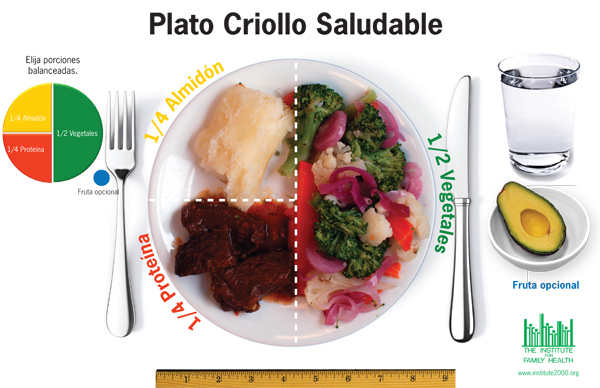 A new kind of food pyramid: healthy plates customized for immigrant diets. For her part, McGeough uses focused tactics with her patients at The Institute for Family Health in the Bronx, NY, 60 percent of whom are minorities, including many immigrants. If her patient is West African, for instance, she may show them a tailored version of the US Department of Agriculture’s MyPlate, which replaced the food pyramid last year as the federal guide to healthy eating. McGeough’s version also has a multi-color graphic of a plate, one split into 1/4 starch, 1/4 protein, 1/2 vegetables and an optional fruit. But the options shown on the plate reflect foods commonly found on West African dinner tables, such as starchy cocoyam, cornmeal and cassava and protein-filled black eyed peas, maafe and kitoza. When working with someone who is Muslim, she inquires about their fasting schedule and explains how it may affect their diabetes management. For those from the Dominican Republic, McGeough may explain how root vegetables can impact a patient’s diabetes. The customized plate she uses to encourage Dominicans to put together healthy meals has options ranging from starchy mofongo and yams to protein-packed beans and pork. Latinos are particularly at risk for obesity, diabetes and related health conditions like heart disease. According to the city’s Department of Health and Mental Hygiene, 26.5 percent of Latinos in New York City are obese, and Latinos have the highest rate of diabetes in the city–13.2 percent. According to McGeough, many immigrants eat the same amount of food as they did in their home country, but are less active once in the U.S., while others give up traditional foods and switch to the many convenience and easy-to-access foods available here. This can increase waistlines, as well as the chance of developing diabetes. 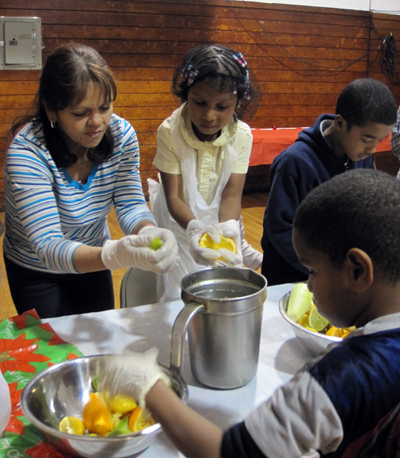 “Lots of communities of immigrants live in low-income areas where there’s less fresh fruits and vegetables available and more fast food,” said McGeough, who was also the nutrition editor of the “Healthy Taste of Corona Cookbook,” which features healthy recipes from the various cultural groups living in the Queens nieghborhood. With diamond-shaped yellow signs screaming “Save More!” in Spanish and English, the Bravo had just a small produce section in the front. However, it did carry an array of products catering to the Hispanic community, like tomatillos and malangas. How to pick and choose healthy foods from this type of supermarket is one part of Lorena Drago’s lesson plan. A dietitian and certified diabetes educator, she runs “grocery store tours.” On one of her tours through Long Island supermarkets last year, most of the participants were from Central America, so Drago altered the shopping list to contain root vegetables such as taro, cassava and Caribbean yams, as well as plantains, pork rinds and creams widely used in the region. To minimize confusion, each food was accompanied with a graphic, since one food can have multiple names in the Hispanic community, she said. Drago said that she’s learned through her experiences of reaching out to different groups that healthy nutrition isn’t an easy concept to teach or apply in one’s life. To make it work, she believes healthy eating messages must be tailored, repeated and reenforced through experiences like cooking classes or group trips to the supermarket. 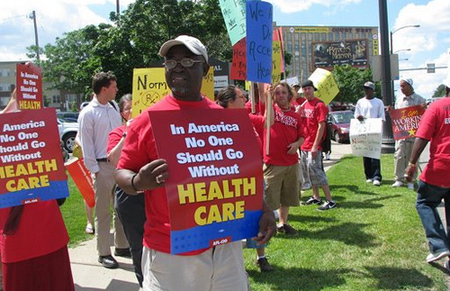 “You don’t get good at this by hearing the message once or getting a pamphlet,” Drago said. Fi2W podcasts are supported by the New York Community Trust and the John S. and James L. Knight Foundation with additional support from the Ralph E. Odgen Foundation, the Mertz Gilmore Foundation and the Sirus Fund, and are produced in association with the CUNY Graduate School of Journalism and CUNY-TV. Juhie Bhatia is the managing editor of Women's eNews, an online news service that covers women's issues, and the public health editor of Global Voices Online, which leverages the power of citizens' media. She has covered health, science and women's issues for over 10 years as a reporter and editor. She helped launch EverydayHealth.com, one of the leading health web sites in the U.S., and was previously a nutrition consultant for the Center for Science in the Public Interest's Nutrition Action Healthletter. She has written for Reuters Health, Planned Parenthood's teenwire.com, Bust magazine, HealthDay, Bulletin for the World Health Organization, iVillage and Natural Health magazine, among others. She is a graduate of Columbia University's Graduate School of Journalism and has a bachelor's degree in nutritional science from the University of Guelph, Canada.